the me you want to be: roger's rules for a bigger, better, more powerful you. Available now in all formats on Amazon. Group orders (20+) available - please contact us to coordinate. In this inspiring, transformational and truly heartwarming book, celebrated keynote speaker, entrepreneur, actor, teacher, director, and writer Roger Haskett helps you discover incredible new ways to create internal power and become the me you want to be. Roger has spent his life walking into stressful rooms where he wanted to do magnificent things but found it hard to do basic things, like breathe. Have you had that experience? 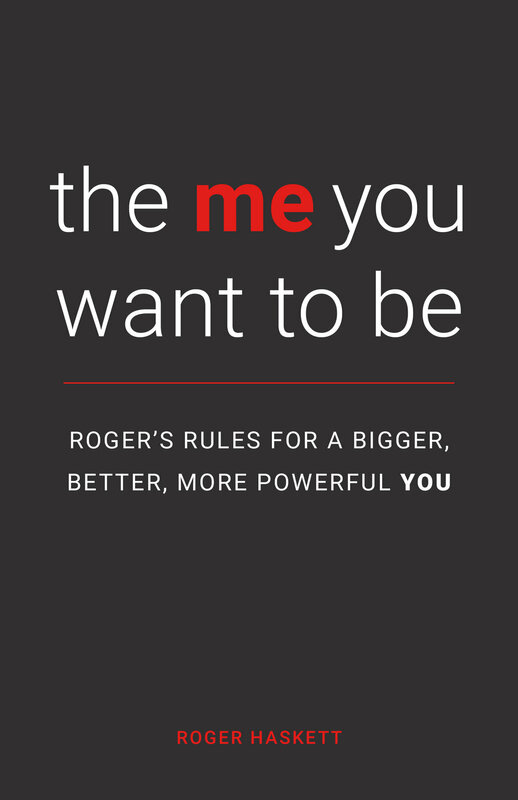 'the me you want to be' illuminates Roger's path towards overcoming internal struggles and setbacks in important moments where he felt the most powerless. You will discover his signature rules - Roger’s Rules - that we will adapt into Your Rules to help you become the biggest, best version of yourself in any situation, no matter how stressful it might be or how hopeless you may feel. Filled with fascinating stories, interesting studies and practical information, you will be moved to make a significant change in your own life and inspired to become the me you want to be. "I read your TRULY AMAZING book, TWICE in fact! So fascinating! It's amazing to see your journey and how far you have come. I am so impressed and inspired... It is truly remarkable."